The global implementation of renewable energy sources (RES) contributes significantly to the development of PV generation at all levels of power. However, experts point out that the process of changing the energy model from hydrocarbon to renewable would be slowed down if it did not massively involve private households and utility companies, which form the basis of so-called small solar power. Where and how will this sector develop? Worldwide, PV-energy is developing rapidly for now and has the best cost savings in comparison with other generation alternatives from REE and has achieved comparable costs to traditional generation of hydrocarbon sources. Figure 1. The world's cost of electricity with RES- price range and weighted average cost. Source: IRENA - Boosting solar PV markets: The role of quality infrastructure, 2017. The development of solar energy is taking place in all sectors, from national and regional super-rating solar power plants (SPP) to small systems in the local communal sector and individual roof installations in private households. And if the powerful stations are in the interests of big business, which has access to the mechanisms of attraction of investment funds, small and individual PV-energy is now accelerating as well, which is mainly based on individual private investments and funds of local communities. During 2000 – 2016, the average annual energy output for small SPP increased by 44%, from 0.8 GW to 291 GW, while prices for PV-modules in 2009-2016 decreased by 80-85%. The rate of deployment of small PV-power is currently estimated at between 18% and 22% per year. Fig. 2. The cost in 2010 and mid-2016 of home PV systems ($ / W) depending on capacity in California (USA) and Germany. Source: IRENA - Cost and competitiveness indicators: Rooftop solar PV. The statistics and calculations of the cost of equipment and the average price of electricity received from PV-installations by the International Agency for Renewable Energy (IRENA) show that small generation from PV stations increases its competitiveness among other energy sectors and has considerable potential for further development. The cost of building solar PV installations and the average energy price (LCOE) for the municipal sector and for private households has decreased on average by 65% ​​and 67% over the past five years, accordinally, sometimes even more. In fig. 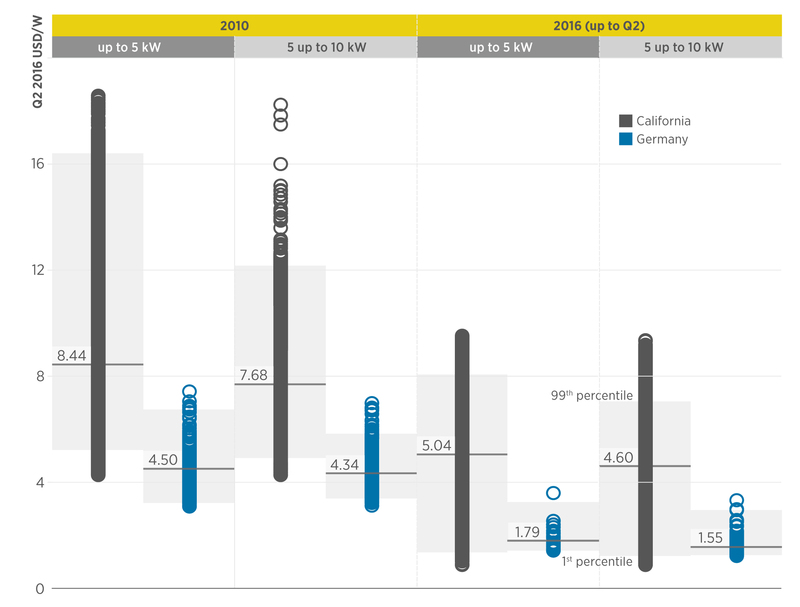 2 it is shown a comparison of the dynamics of spending costs on home-made PV systems of low power (up to 5 kW and 5-10 kW) in California (USA) and Germany. Reducing the cost of communal PV systems is illustrated in Fig. 3 in terms of power levels for small SPPs. In general the industry has become more effective: the light blue zone covers 90% of the costs on systems` building and the steady decline on the cost of installed capacity at various levels in recent years. 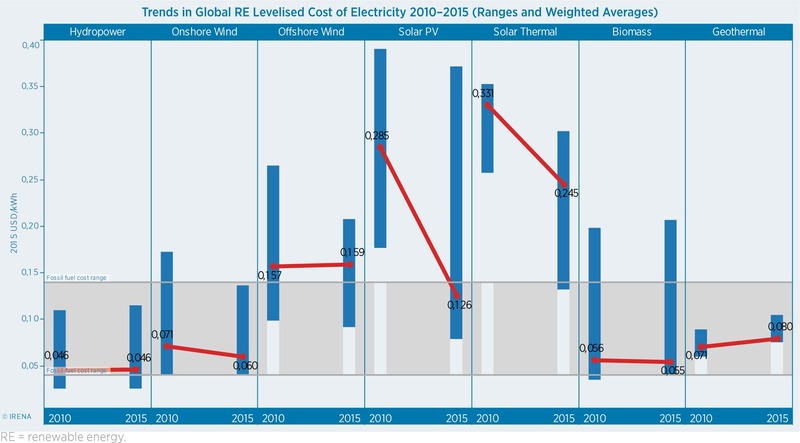 According to IRENA’s forecasts, industry spending will continue to decline, and the average global total cost of building PV systems may drop from around $ 1.8 / W in 2015 to $ 0.8 / W in 2025, decreasing in average by 57% over 10 years (ie, taking into account factors of uncertainty, the cost of projects will be from 43% to 65% of the 2015 level). Fig. 3. 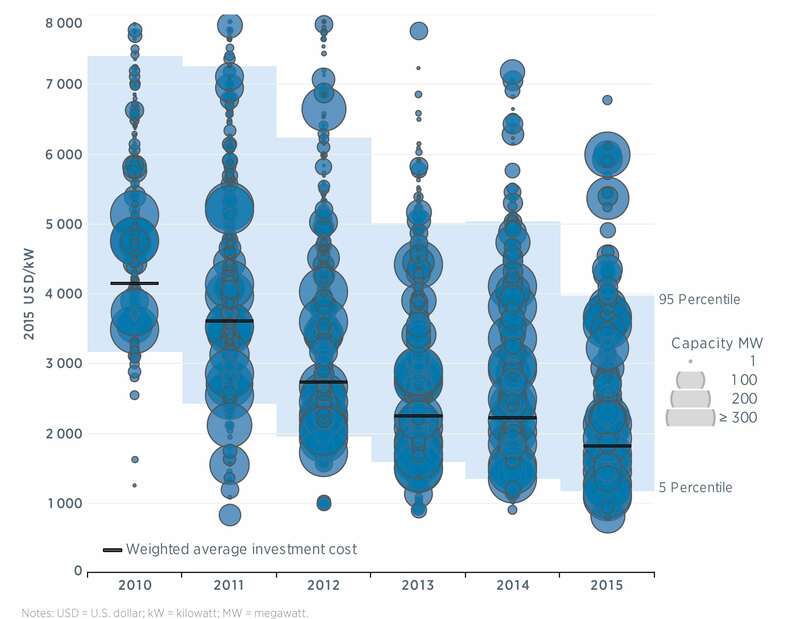 Range of installed capacity and average weighted cost of communal PV systems, 2010-2015, $ / kW. Source: IRENA - Boosting solar PV markets: The role of quality infrastructure, 2017. It is expected that the greatest reduction of costs (~ 70%) will occur due to a reduction in the cost of the BoS (PV system except for the actual solar cell). Throughout its history, the reduction of PV-installation costs was mostly due to the decrease in the cost of PV-modules themselves, see. Fig. 4, but in the future this factor will lose its share. Figure 4. 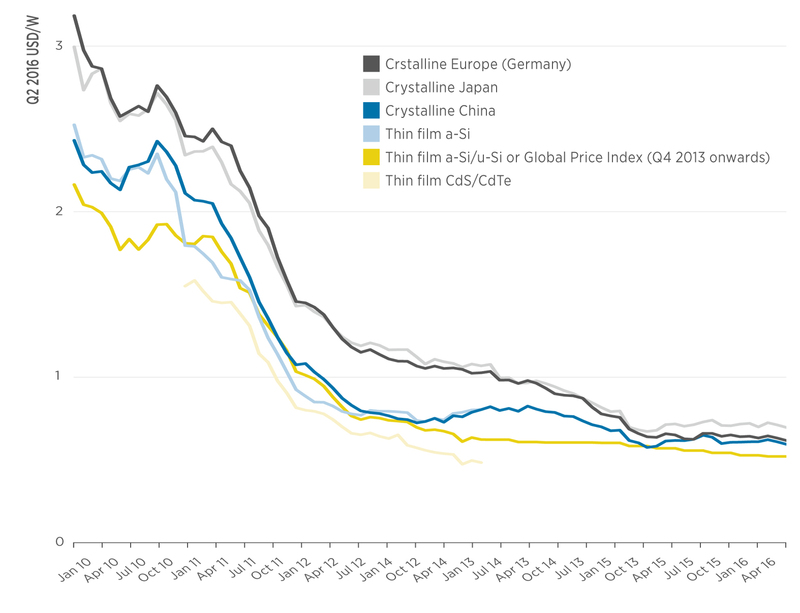 Trends in price changes on PV-modules by type and origin. Source: IRENA - Cost and competitiveness indicators: Rooftop solar PV, 2018. Taking into account that the world price of PV panels is currently from $ 0.5 / W to $ 0.7 / W, even in the case of a very rapid growth in use of PV energy, the contribution from panel price reduction to the total cost of the system will be in further insignificant. Opportunities for further reduction of world value of PV-systems in the next decade are associated with a gradual reduction of expenses for BoS with the help of reduction of the price for photo converters, but the main factor of the impact on the value of the next may be the weighted average cost of capital and other financial factors, such as insurance, since funding is and will be an important element in the implementation of PV projects. According to IRENA forecasts, the weighted average value of LCOE for the PV industry may decrease from $ 0.13 / kWh in 2015 to $ 0.055 / kWh in 2025 (by 59%), see fig. 5. By 2025, the LCOE cost ranges for individual solar home and communal PV installations can fall to the level between 0.12 and 0.03 $ / kWh, which is 68% and 60% lower respectively than 2015. Improving the quality of all components of PV installations and implementing standards remains relevant. For example, there is currently no standard method for calculating LCOE for small SESs. Figure 5. Fall of the world average weighted cost of PV-system for the communal sector. Source: IRENA - Boosting solar PV markets: The role of quality infrastructure, 2017. The issue of quality management affects the technical risks and the sustainability of extraction of PV-energy. 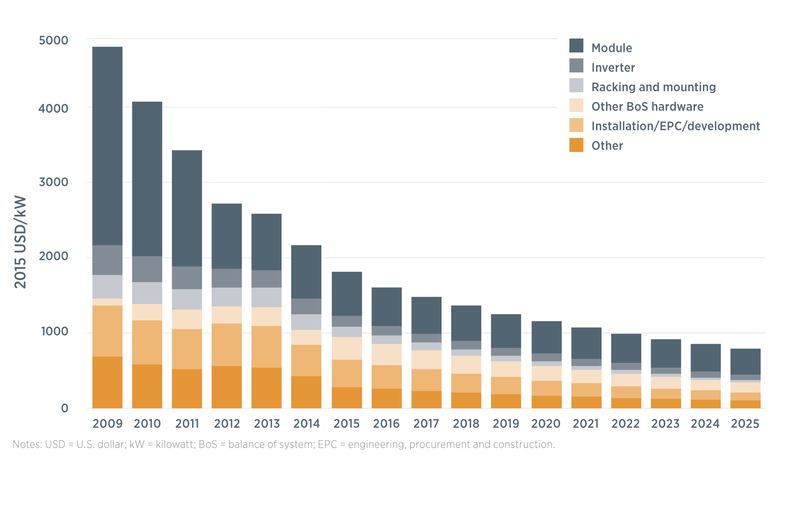 Despite the significant progress, the global market for solar PV projects is still constrained by the uncertainty of the life cycle indicators of PV technology, see. Fig. 6. At the planning and design stages, the quality of all components, for example, accurate data on solar insolation in a given area, has a significant impact on installed capacity, on the expected financial result, on the selection of components of the system ( let`s say, the use of trackers), etc. In the early stages of the project, the risk of failure usually lies on the contractor (EPC) at the expense of the guarantees provided to him, i.e. he is disposed for the short-term quality of the components of the system. In future, the risks of refusing from poorly operated system lies on the owner (community). At the end of the life cycle, guarantees for maintaining the system in a robust state require additional costs and benefits, including insurance, reflected in the final financial indicators. Consequently, the quality of all components of the PV project, together with the quality of the used components and optimized localization of risk reduction, for small roof and communal stations is remarkable and requires careful attention, since these projects are mostly implemented on commercial lending or at their own expense. According to a UNEP-BNEF study concerning Global Renewable Energy Investments, “Global trends in renewable energy investments, 2018” in 2017, the amount of investments in small solar power projects of capacity to 1 MW increased to $ 6.3 billion, that increased on 15% in comparison with the last year. For $ 49.4 billion it was built 28 GW of powers of the smallest SPP – home and communal. However, any comparison must take into account the fact that the actual amount of costs decreases each year relatively to the received power. For example, in 2010, the average cost of a 1 W home PV installation in Germany was $ 3.9, and by the beginning of 2018, it dropped to $ 1.68, or 57%. In Australia, such a drop is even more apparent – the cost of a PV system of 4 kW in 2010 was about $ 6.40 / W, and by the beginning of 2018 – it dropped 78% to $ 1.40 / W.
In 2018, another reduction in the world cost of PV modules is expected at least on 15% due to the launch of new production facilities. However, price characteristics are not the only thing that contributes to the development of a small solar generation. 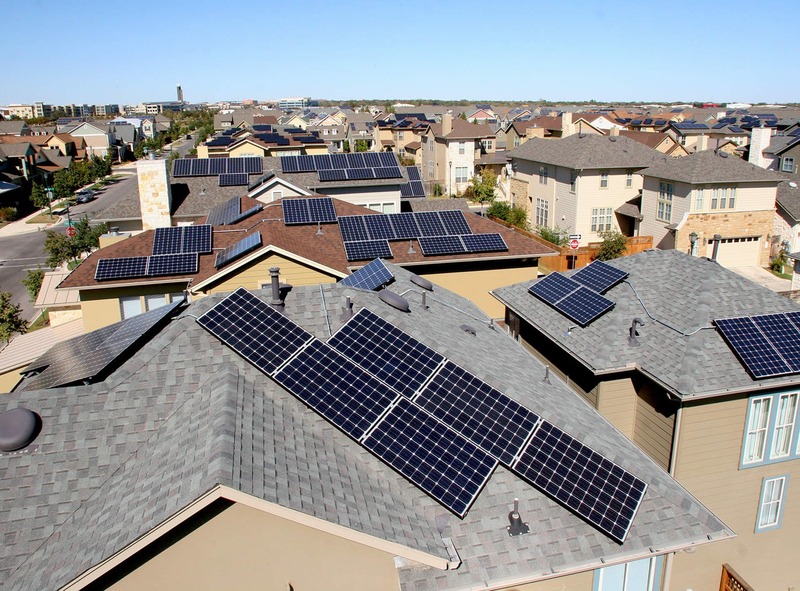 Small installations on roofs of buildings allow access to the benefits of electricity consumption where they have not been available before, and gives the opportunity not to depend on restrictions on connection to existing electricity grids. These opportunities also contribute to the development of small businesses in the area. By the way, Ukraine is also currently preparing legislative initiatives that will remove some restrictions and encourage more usage of roof PV installations for industry and the communal sector consumption. Figure 7. Dynamics of increasing the number of solar installations on private households in Ukraine. Source: State Energy Efficiency of Ukraine, 2018. According to the IEA, the autonomous PV-decision segment of the municipal sector currently occupies approximately 1% of the total capacity of small SES and roof installations (see Figure 8). 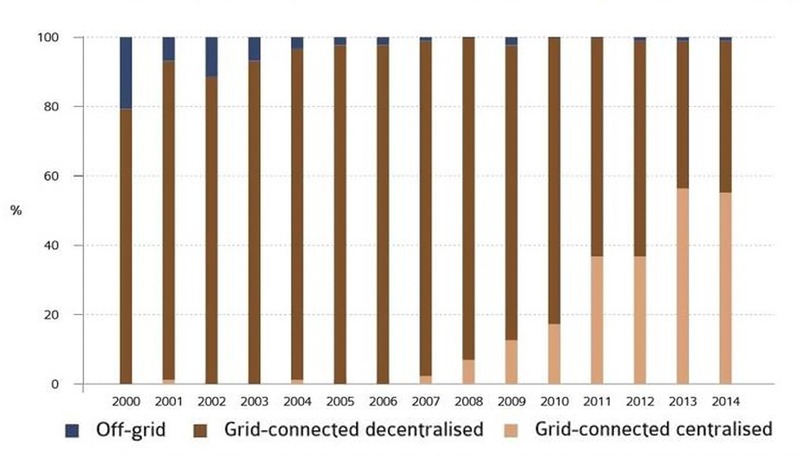 However, the trend towards autonomy will eventually become more powerful, observing the fact that energy needs for private housing and communal services are growing faster than expanding and modernizing the centralized electricity grid and connecting to it; as the combination of PV-installations with systems of accumulation of electric power allows to sometimes reach a competitive price with the cost of electricity from the grid. For example, the expected LCOE during the entire life cycle of a communally distributed power system implemented in Austin, Texas, USA, which will enter the full-service mode in April 2019, see Photo is estimated at $ 0.14 per kWh. Figure 8. Installed PV installations by types and their share in the world. Source: IRENA - Boosting solar PV markets: The role of quality infrastructure, 2017. The sustainability of the development of small SPP for home and communal use, doesn`t matter whether autonomous or networked, is inextricably linked with the introduction of ESS systems, including the use of electric vehicle batteries (V2G) and intelligent energy redistribution management.